Schapelle Corby: Australian Woman To Return Home This Week After Nearly 10 Years In Bali Prison : The Two-Way Schapelle Corby's case captivated the Australian media when she was arrested for drug smuggling in 2004. Now she is returning home, after nearly a decade in prison and three years on parole in Bali. 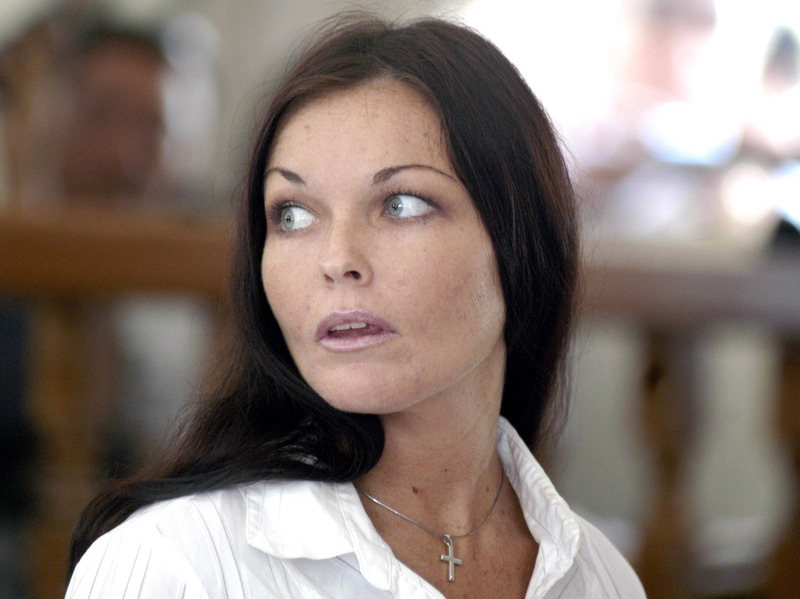 Schapelle Corby's trial was covered feverishly by the Australian media and broadcast on multiple TV networks. Her guilty verdict and 20-year sentence caused outrage and calls for boycotts of Bali, a popular tourist destination for Australians. It's not entirely clear why Schapelle Corby's case so captivated a nation. The Australian woman was 27 in 2004 when she was caught with 9 pounds of marijuana in her bag upon landing in Bali for a two-week vacation. She was convicted in 2005 and sentenced to 20 years in prison. That sentence was ultimately reduced, and in 2014 she was released on parole. Now, she is set to return home to Australia this week. Before her arrest, Corby was an ordinary young woman, working in her family's fish and chip shop in the suburbs of Australia's Gold Coast. And yet, as The Sydney Morning Herald reports, hundreds of thousands of Australians watched in 2005 as Corby tearfully awaited her verdict. The Associated Press compared the "media bonanza" of her trial to that surrounding O.J. Simpson's. Corby has inspired an HBO documentary, "Free Schapelle" T-shirts, and a call for a boycott of tourism to Bali. Her case inspired diplomatic dramas between Indonesia and Australia, and even a new slang term — to be "schapelled," or "screwed over, brutally." Corby has always maintained her innocence, which might explain in part why her case has captured so much attention. Her face was splashed across tabloid covers and television screens. Fiona Connolly, editor-in-chief of Woman's Day magazine, recently told The Sydney Morning Herald, "I was the first person to put Schapelle on a magazine cover. My publisher said, 'Are you joking me?' But that issue sold its socks off. She's a profitable cover star." An unauthorized version of Michael Buble's song Home played on Australian radio stations during her trial, mixing in quotes from Corby. Far from being upset about the remix, Buble told The Sun Herald he was glad his song was being used to cover the case. "This song was written for people who are going through hard times such as this. I hope she can find her way home," Buble told the paper in 2005. Some have speculated that Corby's case became sensationalized in part because she was so "ordinary." As Australia consular affairs expert Alex Oliver told The Sydney Morning Herald, "It could have been me or my child." Many Australians travel to Bali (1.14 million in 2016, according to Traveller.com) and perhaps Corby was simply easy to project anxieties on. Australian travelers now often wrap their suitcases in cling film to prevent tampering with luggage, according the Herald. But support for Corby sometimes took on ugly, nationalist tones. In an academic paper in The International Journal of the Humanities, media studies professor Anthony Lambert argued that Corby became a symbol of national identity for Australia. She represented whiteness, female vulnerability, and perhaps the suggestion of "Western ways of being under threat" as she faced trial in a foreign country, in a foreign language. A terror attack in Bali just two years earlier had killed 88 Australians. Lambert argues this history was fresh in the minds of those who tuned in to watch as Corby sobbed, at the mercy of a foreign system. At times, the coverage became overtly racist. Lambert recalls Sydney radio talk show host Malcolm T. Elliot comparing the Indonesian judges to monkeys, saying, "They are straight out of the trees." As for the woman at the center of all of this, she remains mysterious. Though Corby co-wrote a memoir, published in 2006, she has mostly shied away from the media attention. Her family has asked for privacy as she prepares to return home, but one can only guess it will be difficult to find. As the editor of Woman's Day told the Herald this week, "I'd be sitting next to her on the plane if I could."